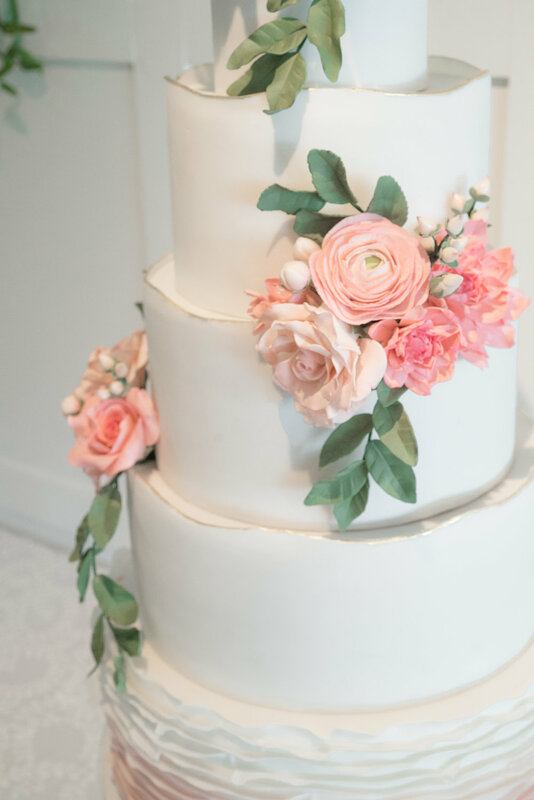 Farina Baking Company is a Twin Cities premier caterer specializing in stunning custom cakes, dessert displays, wedding cakes and crafted sweets! I can confirm firsthand that Tracy Kohler and her team deliver a sweet, elegant, and flavorful experience! She was my first choice when it came to deciding on deserts for our own wedding and I owe it all to Instagram and Tracy's beautifully designed and delicious desserts. Ignore me, and just keep reading on to learn more about Tracy, Farina Baking Company, and how long it takes to make those 3-tiered cakes! Tracy, give us a quick history of how you started baking and how Farina came to be about. Farina started out because I wanted to create something that I truly loved to do every single day. I was in a career, that to me was not completely satisfying. There was no creative outlet and I just simply wasn’t passionate about what I was doing. My husband and I traveled all over and we would travel to eat. We love to watch how food is created, where the ingredients come from and how they are utilized in dishes. I love food more than anything! While I was in my corporate position I needed something every day to complete that I was passionate about and I wanted to learn more than anything. So I started working nights and weekends with various chefs in the Twin Cities. I started on the savory side, although it always felt like I belonged more on the pastry side. As “geeky” as it sounds, I really enjoyed the science behind it. After some serious thought, I decided to leave my corporate position (which at the time I chalk up to temporary insanity, ha!). I am sure almost everyone I knew thought I was crazy. I had a really wonderful career, with a fabulous salary, amazing benefits and I left “to bake”. But it was the best decision I made and it just truly felt right. After a year and a half baking in a Minneapolis bakery, I was approached to be in the local farmers market. After quite a bit of contemplating, my husband and I created Farina and we went into our first Farmers market four years ago. We were lucky to sell out each weekend and clients would ask us frequently where to get our items outside of the markets and so we began the catering side of the business. As we slowly grew, our client base would constantly look for cakes, cupcakes and other desserts. We created our menus and then a year later introduced it to the Minneapolis wedding industry. Our first year working with couples was extremely successful, more than we could have hoped, it was an amazing first season. So many stories of bakers begin with how they grew up with their grandmother baking and have been doing it their whole life. This was not cased for me, I found baking later in life. I simply had a passion for something and I ran with it , I learned from it because I wanted to share it with others! Your desserts are designed to perfection, can you give us a little insight on how your desserts are designed? Wow….this is an amazing compliment, thank you! Honestly, we try to produce the best we possibly can. I like to utilize inspiration and experience in what I have watched and learned so intensely over the years. I want guests at an event to try something and walk away and say wow, where is that from? You have to start with great ingredients! Something isn’t going to be great unless you start with something great. We focus on our desserts being delicious, looking amazing and being consistent. You stand out from the crowd with your delicately designed pieces, where do you draw inspiration for all of your work? We try to be different and design desserts that are unique, which can be really difficult in the world of social media and Pinterest. Most love what they see in their feeds and want the same thing. We try to utilize this as inspiration and use our clients' personality or their event theme and create something that is unique to them and to their celebration. But truly in a perfect world, there are so many areas to draw inspiration from, way too many to list. Look all around you, the sunset at night, that fabulous design on that throw pillow, that perfect dahlia in the garden. Inspiration is everywhere, sometimes you just need to stop and look. I have so many random pictures on my phone, where I take it and I say “I can bring that into a cake one day” or “ahhh, that would look fabulous on a cookie”! What are some of the services you offer to clients? Farina Baking Company is a dessert catering company that offers cakes, cupcakes, mini desserts and custom sweets. We work with a broad spectrum of clients. 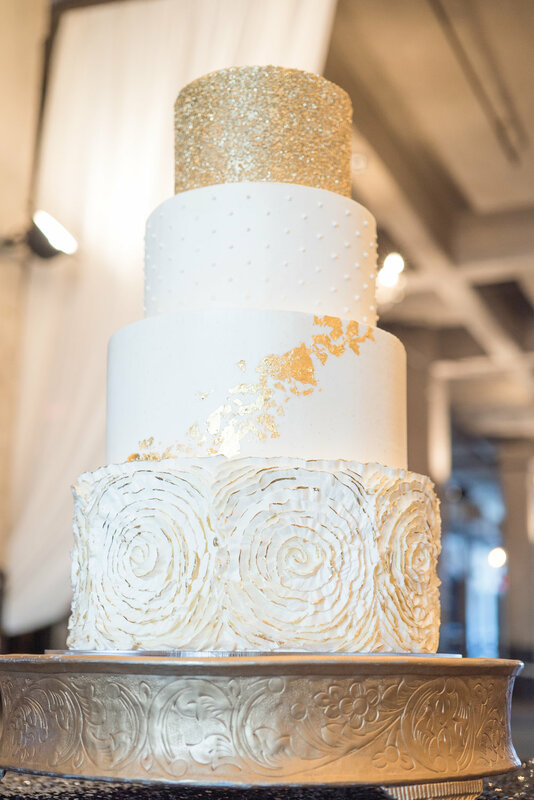 We have our amazing bridal clients who work with us on anything from dessert display tables to custom 6 tier wedding cakes and everything in between! We work with our corporate clients on our sweet offerings for all employees special milestones and custom logo items for their company events. We love working on all birthdays, graduations and anniversaries. Every celebration needs a little something sweet! We offer delivery throughout the Twin Cities and beyond and we offer pick up at our Production Kitchen in Excelsior. If you were to pick one (or two) Farina specialties (or favorite items), what would they be? Seriously??? I feel like that is an impossible question to answer:) Everything that was created on the menu came from what I love in some respect. Our Lemon Poppy Seed wedding cake is on the menu because I could eat it everyday!!! My ultimate favorite dessert is Nancy Silverton’s Budino, which I put into a little dessert shooter (Verrine) and the dessert I have always adored to make is my White Chocolate Banana Cream Tart, which I made into our bite-sized tart. Crowd favorites seem to always be our delicious Chocolate Salted Caramel Cake/Cupcake, Red Velvet Cake/Cupcake, Salted Caramel Budino Verrine, our classic Fruit Tart and any flavor of our Cake Pops or French Macaron !!! Be honest, when it comes to a wedding cake (let’s say 3-tiered) how long does it take to design and make? It depends on the overall design, but we have spent hours….days on completing a cake. We take pride in our cakes and do them right! I don’t think people realize the time it takes just getting them to the point to decorate. You need to bake them, fill them and then we ganache all of our fondant cakes, cover them with fondant and then stack them. This alone is hours worth of work…..and NOW we can decorate! Sugar flowers are something I wish I could do on every single wedding cake! They are gorgeous and people are always amazed how realistic they can be. But they are extremely time-consuming. Each petal is rolled, cut out, veined and ruffled. Then it needs to dry for a day before coloring and assembling them. And they are ridiculously fragile, but the end product is truly gorgeous! The overall time on a 3 to five-tier cake could take progressively up to three days with sugar florals starting well before that. Tell us a little bit about how you source your ingredients. We have put a lot of time and energy in sourcing ingredients. We attempt to utilize locally sourced where we can, such as our local Hope Butter. When the seasons are on our side we use in-season fruits such as raspberries and apples. We create with quality with items such as amazing chocolate! If someone wants to book you for their celebration, what are the steps they need to take? Do they shoot you an email? Schedule a meeting? You can always reach us via e-mail at info@farinabakingcompany.com or call us at 651-253-7126! 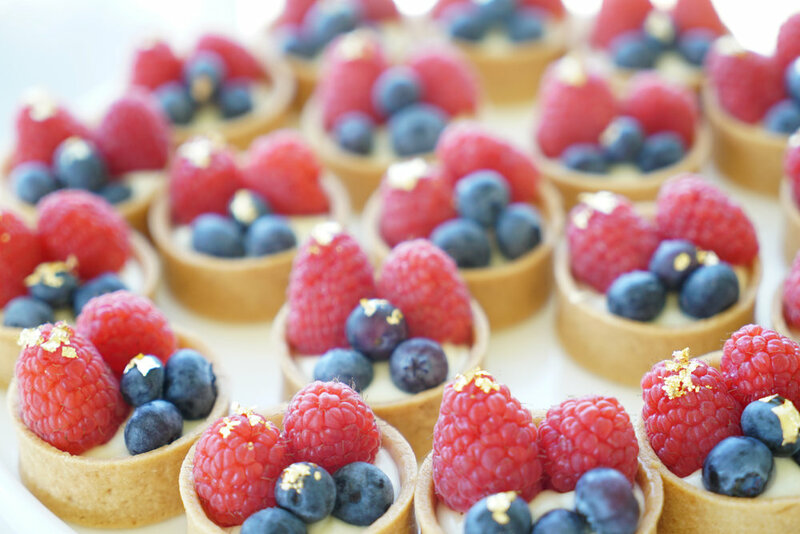 What if a wedding client wants to give you creative freedom on desserts, what would you do? The key is to really try to learn what they are hoping to get from our design. One can say “Just do what you want” and that can mean a couple of different things depending on the person. I always ask more about the event itself what they are looking to get from the custom work and they really need to know our style to know what they are going to receive in return. I have worked with some of our clients from the start of business and when they allow us creative freedom, we tend to know them and they know us. But new clients I always will ask questions to really hone in on what they actually will want. Well, I happily LOVE all things pretty and we love to showcase what we create. I try to shoot the majority of the shots myself and I love shooting our desserts! We are also REALLY lucky to have an industry of ridiculously talented photographers and creatives in this city that makes our desserts really shine!! Anything else you want people to know about Farina? Farina Baking Company is based off one pretty incredible team. Matt Kohler is the person behind the scenes. He is completing everything on the back end that most people don’t realize that is occurring to keep things running smoothly everyday…. payroll, taxes, new supplier relationships….all the EXTREMELY fun things! We have literally the most amazing kitchen staff…..there simply isn’t a day that goes by that I tell myself how extremely grateful I am. Finding a team that isn’t only hardworking and talented but also driven and passionate as much as you are is a rare find. Each and every one of us brings a different talent into our kitchen, so when you say that we bring perfection in our desserts it’s because the creative team building these desserts is immensely great at what they do each day!